At Labelexpo India 2018, Vinsak’s was one of the busiest stands. Vinsak displayed six machines, two of which were Lombardi presses – a Synchroline 430 8-color flexo label printing press with a Toro unit with hologram and mud stamping, and Lombardi Synchroline 530 8-color flexo printing press with an overlap unit capable of printing multi-layer labels as well as 20-micron film for flexible packaging. 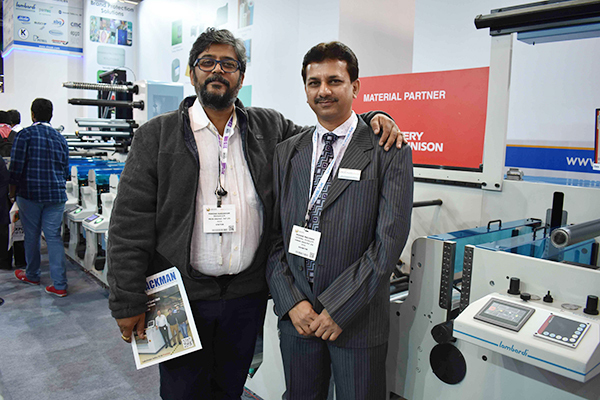 Both the presses got sold at the show – the Lombardi Synchroline-530 was sold to Ahmedabad-based Prakash Printers and Coaters while the Lombardi Synchroline-430 was sold to Delhi-based Polylam Printers. Meanwhile, Vinsak also booked four more orders at the event for Lombardi machines which will be installed by March 2019. Mumbai-based Prakruti Graphics booked a Lombardi Flexoline Plus press. This would be the first Flexoline Plus from the house of Lombardi to be installed in India. Prakruti plans to use the press for printing labels with foiling, security and tamper evident labels primarily for the pharmaceutical and FMCG industry. The Flexoline Plus is a servo press without a line shaft offering servo-driven plate cylinders. The press is equipped with pre-register control for setting up jobs fast, with less wastage. On the finishing line, the company displayed two Vinsak USAR machines, one with a Vinsak Inkjet system and a Lake image camera for 100% verification. The second Vinsak USAR was equipped with the Domino K600i Inkjet system, a registered diecutting unit, inspection system and dual slitting and rewinding options. Vinsak sold as many as eight USAR machines at the show to customers from India, Bangladesh and East Africa. The all new Vinsak USAR is modular in nature which allows customers to configure slitter re-winder, diecutting, 100% inspection system and inkjet system according to their requirements. With all major components driven by servo motors, the equipment runs at a speed of 300 meters per minute. It is backed by powerful software and features a HMI display for easy job set-up and single window operation. In addition, the company launched the Vinsak Table Top rewinder a dedicated solution for rewinding of printed materials from roll to roll with label counting machine useful for verification of the quality, as well as for the correction of wound materials. The company also showcased its new version of the table top reel lifter, VRL350/250, equipped with safety locks on the rear wheels to hold the cart in place once in the desired position and to keep the cart from rolling while in stationary position. Vinsak’s other partners ABG International found a host of leads at the show for its Digicon range of digital converting equipment, Iwasaki International launched the IF330 Intermittent flexo press and an upgraded version of the TR2 press with additional features, Pantec AG offered its market leading Rhino and Swift solutions for foiling and embossing, and Schober Technologies offered its range of rotary tooling as well as IML diecutting machines.